Amir's RMAF Day 2 teaser | What's Best Audio and Video Forum. The Best High End Audio Forum on the planet! Hi guys. Another teaser for day 2. Best sound today was the Wilson room. Someone needs to educate me on what they are. 1. Happy to report that everyone read the #3 in my last report and took showers this morning. I say only 10% of the rooms smelled so bad you had to walk right out. 2. Whoever said manufacturers have been making brighter and brighter loudspeakers because older folks like us lose high frequencies was darn right. I have a headache the size of Manhattan from listing to nothing but high-pitched sound reproduction. I think the problem was that in all cases, the guy doing the demo has more white hair than I did . What happened to nice and mellow high frequencies? 3. Went to the Kii room again. Sadly nothing was fixed. The guy was there playing the same European tunes. Highs were sharp, vocals depressed and lispy. Michael said maybe the second row may sound better so I sat there too. It took a bit of the edge from high frequencies but that was it. These loudspeakers are just loud bookshelf speakers sorry to say. Power delivery is not a problem. The speakers are small and sound small. They said there are 12 settings on them to adjust for distance from the corners and such. Maybe someone else needs to mess with them. I don't know. I really feel bad about being so negative but for a speaker with so much potential, a very faulty experience was presented in my opinion. 4. What a relief it was to go to the Wilson room and a) hear digital instead of LP , and b) mellow sound with excellent bass. The two passive subs really helped there. 5. Reel to Reel is completely missing in action! I only saw one Studer there for decoration and that was it!!! 6. Went to the PS Audio room with YG loudspeakers. I highly recommend people instead go to the YG room itself to hear the smaller version sound better in that room. Mind you, the room sounded good but not reference quality like YG's own room. 7. I have shot 188 imaged for day one and 291 for day two . Heaven help me as I go through them all and clean them for uploading. I don't know how people do this kind of work for a living. Every room was pitch black. My new Canon 5D Mark III struggled at 3200 ISO to take these pictures. They are all 100 times less bright than what you see. Don't these companies want decent press for their work? Why have the dark gear in dark rooms??? 9. I am too tired and going to sleep. Good night guys. 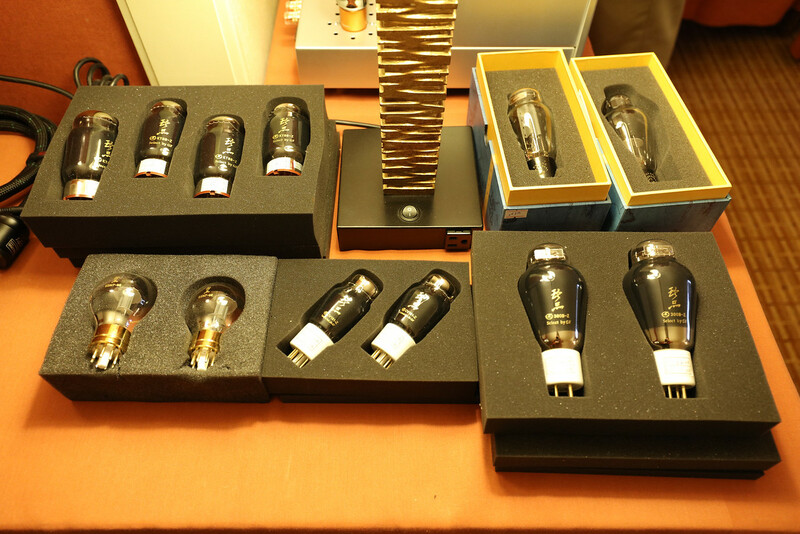 That is the KR Audio T1610 triode. It was designed by the late Ricardo Kron and continues to be built in the KR facility in CZ, where the bottles are still hand made from blown glass similar to that of Pyrex. 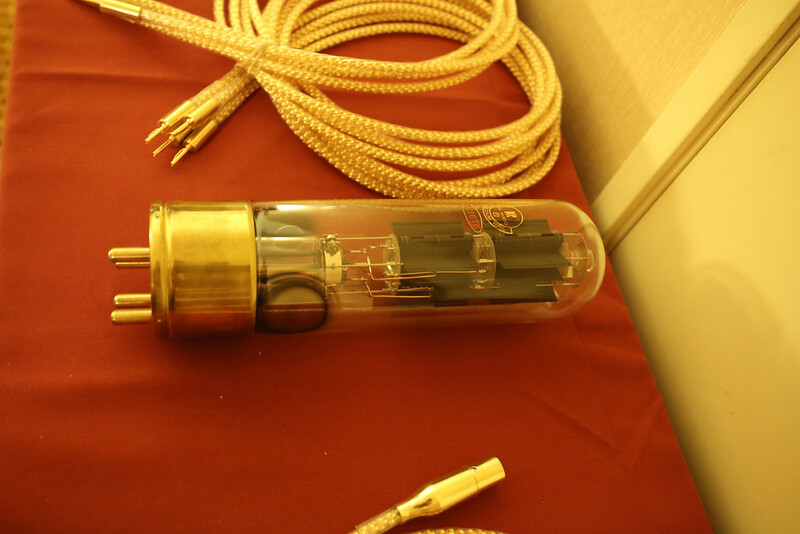 It is a fairly modern tube and one of the few high wattage triodes designed in recent times specifically for audio reproduction. Each tube can be used to produce 50wpc run single ended. These tubes are used with KR's own amps but have also been used by Cary Audio and I believe most recently by Allnic in a prototype. The KR tube manufacturing factory is the one shown in a video you actually posted some years ago right here in WBF. Couldn't agree with this statement more. The issue has definitely been getting worse in the last few years. I think this is also one of the reasons that so many ladies are turned off by our hobby. ( Remember guys, ladies hear better than we do ). I beleive i brought up the notion of paint peeling tweeters in super expensive speakers. These are marketed as having "extended" treble response...yikes. Amirm, love the posts. And certainly understand the time on all the digital pics. Thanks for posting what you have so far. Thank you Amir for your efforts to share RMAF with this forum. I have noticed the same thing about high frequency energy with some expensive new speakers. One notable exception is Magico's new tweeter and crossover, first introduced in their M Project limited edition speaker and now finding its way into their flagship Q7II with a variation in the new S7. I have heard the M Pro and can report that the upper frequencies are ultra detailed with outstanding resolution, yet there is NO hint of brightness, etch, glare, sibilance. It just sounds natural. Alon Wolf still has his hearing and is perhaps simply trying to create the best speaker that he can with less specific regard to a greying target market. I appreciate your return to hear the Kii room again. This is a design, that on paper at least, I thought would appeal to your sense of accuracy and technology. It is a speaker that has been so highly touted in these pages that, frankly, I am shocked it is receiving the negative opinions from those who have heard it at this show. I had the impression that its design in particular was meant to address poor room issues thus it would sound excellent in show conditions. I suppose it is not surprising now to read that its supporters are assuming something is broken. I respect your experience with listening tests and not having heard it myself, I place some weight on your observations about this product. I look forward to your posting of the photos. That's tons of work...thank you for doing it, so the rest of us can sit at the desk, relax with a cup of coffee and the am and enjoy all your hard work and effort! 1.- No tape decks - understandable, hard to carry, limited software, no please-the-visitor tracks. 2.- brighter highs - agreed, I won´t name manufacturers but more than one are on the YANG side on this, I have a strong bias against this kind of high freq reproduction. Eagerly waiting for your pics and notes! I do think the push for extension, detail, detail, and more extension (plus new fangled materials/tech for tweeter drivers) has enticed designers to experiment...and some have lost the plot along the way. The interesting thing is that this technological push for detail, extension, linearity...which comes along with the most recent generation of products...is also followed by a remarkable resurgence in vinyl among the youngest generation buying equipment who (at least the ones i speak to) tell me they feel vinyl sounds better and use it as their reference for sound. Particularly, they speak of life, weight, 'natural' not-so-brittle-treble and weightier, meatier mids/bass. Thanks for posting your impressions, Amir. Those of us who can't make it there live vicariously through your posts. As mentioned, those are KR Audio 1610 tubes in a stereo 50W SET amp. I have heard them before driving a pair of Tannoy Westministers. They have a kind of dry tonality which is somewhat understated. I initially was not a fan but grew to really like them. I have a Canon 5D Mk.3 as well. About to jump ship for a Sony A7S Mk.2. If you want high ISO sensitivity (at the expense of resolution) ... this camera is it. For me the biggest plus is that they will take Leica M glass, and even Canon glass via an adapter. 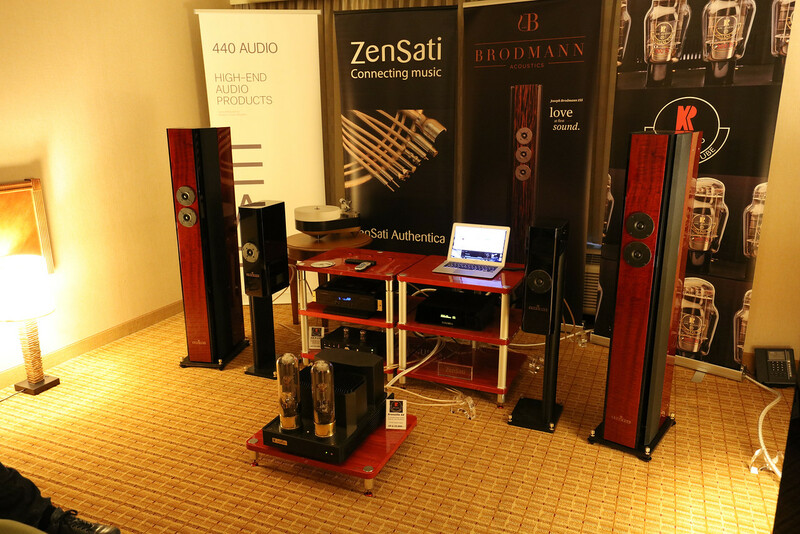 I can only comment on the overall system sound through the Brodmann bookshelf loudspeakers (the smaller black ones). I didn't like the sound and I attribute that to the loudspeakers/demo, not the amp. I was hoping they would switch to the larger loudspeaker but this was one of the rooms where the people there were chatting before I came in and continued to have their "meeting" while I was there . Thanks Peter. I have not yet been to Magico room. Hope to finish seeing everything today including that room with the context of the rest of the show still fresh in my mind. My pleasure. It is so great to see you all appreciate these few words. Boy I am so tired I can't even remember my own camera model! It is actually the new 50 megapixel Canon 5Ds. Canon has fallen behind in high ISO sensitivity and this was indeed limiting at the show with max ISO of just 3200. My son bought the Sony R7 II (34 megapixels) and then thing literally makes its own light . Ah, so I already knew the answer and just didn't remember it. Thanks Jack. Here is a bonus image before I pack and run to the show for those of you who are into tubes. I assume these are special seeing how they were put on display this way? I should say tubes and turntable combos dominated the rooms and demos. PranaFidelity has a rtr and is well worth checking out. On photography, do you have a night/twilight scene selection? My Sony NEX has this mode and it will take a series of 5-7 pics and combine them to get the right exposure. It works great for shooting flashless and capturing the natural lighting in the rooms. @davec - if Amir is using his Canon then yes it has a function that may not combine different exposures but rather take a burst of shots at exposure/ f-stop intervals. It's called bracketing and it can be performed by most if not all DSLRs. AFAIK however it has to be manually set and is not a mode or scene selected. Now you're making me look for my RX1 manual to see if it has that feature or not! I found some photos online of the PS audio/YG room. The only components I see visible for the front end are the Perfectwave memory player, preamp and Directstream DAC. But in the close up shot I noticed that the Directstream is on the USB setting. Since the memory player transport has no USB output, was there a general purpose computer hiding behind connected via USB and a REGEN? If so, did you get a chance to hear with REGEN, without, and comparison with I2S from the transport, and Ethernet via the bridge? I would have been in heaven in that room comparing all 4 configurations. Hearing your subjective opinion of "what's best" out of the 4 would be priceless.